It was one of the busiest weekends in recent memory for the Southwest’s combat community as there was so much going on all-around the world. Boxing and MMA, regional shows and the UFC; New Mexico especially had so much going on that we as a staff couldn’t touch on everything going on despite our best efforts. In our second wind of coverage, we have accumulated as much of this weekend’s MMA coverage in a Monday Morning Recap. Condit is without an opponent for this week’s UFC On Fox event as Matt Brown withdrew due to an injury. In the most unfortunate news of the weekend, fan favorite and perennial top contender John Dodson was forced out of next weeks UFC On Fox fight card with an injury. Tears in the knee ligaments forced “The Magician” out of a scheduled bout with Flyweight division newcomer Scott Jorgensen. Dodson spoke to us backstage at the “Havoc” event on Friday night, telling us that his injury is significant enough to force him out of the bout but not major enough to keep him sidelined very long. He is able to still walk on the leg as the tear is around 30% of a complete tear. The same fight card also featured Carlos Condit and Matt Brown in a hotly anticipated Welterweight bout. Fight fans were appalled to find out that Brown suffered an injury late last week that will keep him from the bout. Due to a back injury, Brown was scratched and Condit has been rumored to have been moved to February’s UFC event that features Daniel Cormier vs. Rashad Evans. One of the most seasoned veterans of WMMA has decided to call it quits. After a few tough outings, Jackson-Winkeljohn product Julie Kedzie (16-13) has competed against the sports very best including Gina Carano and Meisha Tate. On Friday night, Beth Correia got the better of Kedzie on the Judge’s scorecards and Kedzie took to Twitter to make her announcement soon after. Before walking out of my fight today, I had a long talk with my coach and we decided that this would be my last MMA fight. I would have loved to have gone out on a win, but c’est la vie-don’t leave it to the judges. Heartbreak is a huge part of this sport. I really truly want to thank all of you for being a part of my journey as a fighter. I will still be involved in MMA for the rest of my life… but now it’s time for me to accept that I can give more to the sport by stepping back and taking role in helping to develop other fighters. From the bottom of my heart, thank you to the @UFC, my team, and all of you who have made me achieve some amazing dreams. On behalf of the staff here, we wish Kedzie the best on her future endeavors. Kedzie has been a long-time personal favorite of mine and I have no doubt that she will aid in bringing up the new wave of WMMA fighters. Representing the new wave of MMA fighters, Landon Vannata improved to 4-0 with a rear-naked choke victory all the way across the world. Vannata scored the win at 4:13 over Mitsuyoshi Nakai at Pancrase 254 in Tokyo, Japan. The win represents arguably Vannata’s biggest to date as he broke into a whole new market in a whole new country against an opponent who comes from an area very unlike the Southwest or even the North American regional circuit. I expect big things from Vannata in 2014. From the onset of the contest Lara was able to time Trout (26-2, 14KOs) with short counter shots as the New Mexican attempted to implement his trademark lead right jab. To the distaste of the Brooklyn crowd, most of the fight took place from the outside. Despite having a three-inch arm length disadvantage it was Lara who was able to capitalize with lead jabs and strong combinations. In what was labeled as the last major combat event of 2013 for New Mexico, Fresquez Productions brought a stacked card of talent to the Route 66 Casino. The favorites to win swept the night’s bouts as there was not any upsets on the “Havoc” fight card. Check out our “Sunday Retrospective” for our post-fight commentary and analysis. 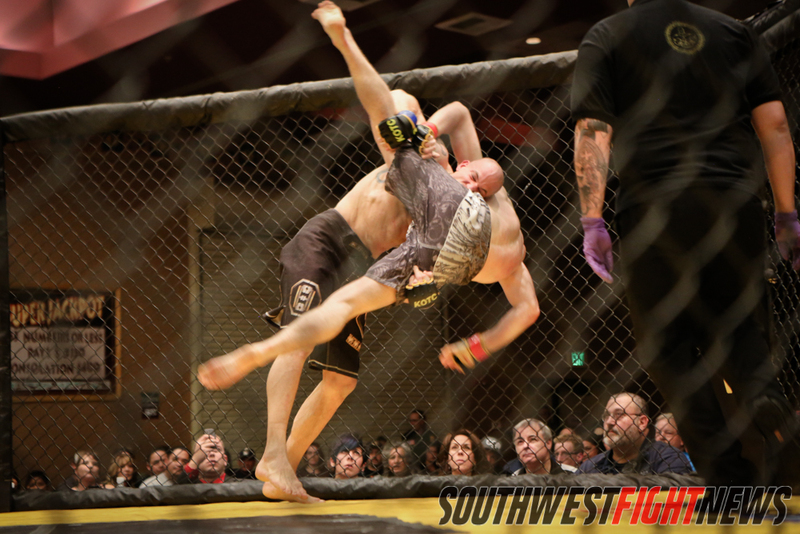 The King of the Cage event inside the Ute Mountain Casino was full of high-flying action. 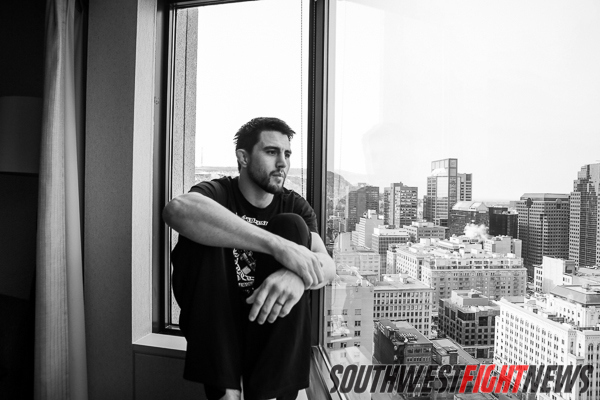 Now three-fights from being cut from the UFC, Garcia is making a meteoric rise back to prominence in the Texas regional circuit. Now 3-0 in the Legacy FC promotion, Garcia has now captured the Featherweight Title. Garcia has finished all three fights, two of which have come by way of stoppage due to strikes. An uppercut staggered an undefeated Kevin Aguilar and Garcia was all over him forcing the stoppage. While Garcia called for a UFC return, I don’t think that will be the case as Garcia’s run in the UFC wasn’t impressive enough to warrant a quick comeback. It has been nice to see Garcia picking up the wins on the regional circuit and I expect to see more victories in the Texas-based promotion in 2014. The SWFight crew went on a field trip to the Cortez, Colorado area where we were live providing coverage inside the Ute Mountain Casino for King of the Cage “Driven”. While the event lacked the notable names or “star power”, the event was full of action including a true classic. In seven-years of watching local MMA, Robert Herrera vs. Kevin Wirth was one of the best amateur fights I have ever witnessed. The fast-paced fight was amazing and the winner was crowned the King of the Cage Amateur Champion. There was not a single slow-paced fight on the card and outside of the typical intermissions, the event was exciting throughout. We live blogged the event and hoped to spark some support from the fans who did not make the trip to Colorado to watch their gym’s fighters in action. Amongst the notable moments in the night, Amanda Lovato and Melody Nanez put on a show as the lone WMMA bout and debut fighter out of J5’s Seth Leake showed tremendous power earning knockdowns with punches from the right and left hand. The event was great and we will have more coverage as the week goes on. It has been announced that FIT NHB’s Tim Means will return to action on January 31st at Legacy 27 against Artenas Young in a Welterweight bout that is expected to headline the event. The fight will be held in Houston inside the Houston Arena Theater and will be another featured fight for Means as he continues on his comeback trail to get back to the UFC. Means was last seen retiring veteran Pete Spratt with a nasty standing elbow knockout. Means is undoubtedly the favorite in this one and fight fans should expect a full display of the high-level aggressive offense from “The Dirty Bird”. After Friday night’s “Havoc” event, Promoter Lenny Fresquez announced that Holly Holm’s next fight would be in March against Julianna Werner. The bout is expected to headline the first Legacy FC event to be held in New Mexico. Holm will once again meet a Jiu Jitsu specialist and will be showcased on AXS TV. The bout will also be contested for the Legacy FC Title and will be a five-round bout. Stay tuned to SWFight this week for more coverage stemming from this weekend’s action. We want to thank everyone who followed our live tweeting Friday and Saturday as well as the Facebook page and live blog for King of the Cage.